By Moshe Katz, Krav Maga Instructor, CEO and Founder of IKI Krav Maga, present in more than 30 countries. Krav Maga has become big business, and big bucks. This was not the original intention of course. I feel it is tragic what has become of the Krav Maga world. It has become "living in a movie". It has become a bunch of "Israeli commando wannabees". The military success and prowess of the Israeli Defense Forces has been used via TV and Movies to portray Krav Maga as a super-system used by all Israelis. Nothing could be further from the truth. People think that every Israeli woman is like Ziva David from NCIS. (She is not even Israeli or Jewish, the accent is fake, the techniques are not Krav Maga). Jennifer Lopez and her likes are not doing anything like what we do in Israel. Ahh...the American dream. And No, unlike Angelina Jolie we do not fight super monsters, we do not even put people in pretzels like the Zohan does. But all those movies are a great success and some unscrupulous teachers use those movies to market their "art" and draw in the big bucks. What does this photo have to do with marketing? Absolutely nothing. 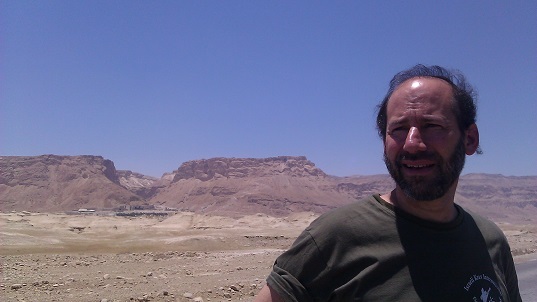 Moshe at home near Masada. As real as it gets. Here everything is real, no glitter, no falsehood, no "Hollywood", I love it! Yes, we all must work, yes we all must make a living, but there are different ways of going about doing this. We can learn a trade and ask for a fair price for our services or we can become swindlers and live by "a sucker is born every minute" and "A fool and his money are quickly parted". We can build castles in the sky and find ways to cheat people and take their hard earned money or we can find something of value to offer them in exchange for a fair price. My late father once invested in a kosher hotel in Hawaii; there was never any intention of building it. Dozens of rabbis such as my father invested their hard earned pay (and rabbis do not earn great salaries) in this holy project. The entrepreneur just stole their money. Just tonight in our Krav Maga class our top instructors and I were working on a defense against strangulation. We tried to imagine a weaker, smaller person, a child or a petite woman. We tried to find the best way for such a person to survive. At that very moment I am sure other Associations were thinking, "How can we get more people to buy our DVDs, how can we increase our profits?". For us, safety comes first. There is nothing wrong in making money, there is nothing wrong in being successful, the question is what weight is placed on each. What comes first and What matters most. Would you teach a less effective program if it were more viable commercially? Would you compromise your teachings to make more money? For us we always keep the "student" in our minds; what can we do to make sure this person gets home safely. We ask: How can we educate the public better? How can we increase their awareness for the need for Krav Maga self defense? How can we save more lives!! That is why I post my blogs on Facebook, that is why I am so happy whenever I see a "Share". Spread the word! Save lives. We don't ask: What program will bring in more "clients"? Maybe Krav Aerobics will being in more clients but will they really benefit from it? That is the question. I have met so many "Self defense instructors" from highly marketed programs, what can I say? Most of these programs are totally missing the point, most of them are just building false confidence. Wake up and smell the coffee!! Consider this: If you are being offered a highly marketable program (that of course you will have to pay for handsomely) but the "only thing" that is bothering you is the "quality" of their Krav Maga; please remember why you first began training. Please remember why you were first drawn to Krav Maga. Please do not betray what you believe in.